Central banks, for all the posturing, don’t actually do all that much aside from heap generous transaction premiums upon the broker class. In economic reality, bank reserves are divorced from function leaving room only for those who wish to believe in the magic. That is what all the fuss is about inflation expectations, since most people don’t care enough to figure out what a central bank actually does (this is especially true of economists). They are supposed to be taken at the word, which is fine when those words at least vaguely resemble what is transpiring or what has transpired. Japan’s inflation rate remained flat at 0.2 percent in August, according to data reported Friday, with core inflation excluding volatile food prices slipping 0.1 percent. A preliminary survey of manufacturers released Thursday showed a sharp drop in export orders. Recent corporate investment figures were likewise worse than expected. Given that QQE was explicitly promised to deliver 2% “inflation” in 2 years (2 and almost a half later, back at zero or below again) and the related (by yen) economic rebirth of Japan Inc. through exports, the fact that Abe is promising newer and better “arrows” falls flat. QQE was proclaimed so large and intrusive that there was no betting against it. Basic math, at this point, is now working directly against any such sentiment as Japan grows poorer with each “inflation” suggestion. It has become a common occurrence wherever QE is and was. The increase in a central bank balance sheet was promised to be the inflationary channel which would unleash economic transactions for no other sake than expectations about prices, where the mere act of increasing bank “reserves” was believed sufficient substitute for changing those expectations even where there was a distinct absence in ability to connect one to the other. If nothing else, fear over the size of each program were supposed to overwhelm any such doubts, leaving little margin for retrenchment. Yet, each monetary jurisdiction continues to not just underperform those stated beliefs, but even doing so after multiple iterations (including Europe where QE in 2015 isn’t truly different from the LTRO’s implemented with the same ideas in 2012). The European Central Bank president said more than three weeks ago that the inflation rate could turn negative this year because of the renewed decline in oil prices. The 19-nation region is set to take a step in that direction on Wednesday, when data will show consumer prices stagnated in September for the first time in five months, according to a Bloomberg survey of economists. Stalled prices would mark a setback for policy makers who have been trying to steer inflation back toward 2 percent for the better part of two years, and may spark a new debate about deflation risks. And so oil prices are instead segregated as if they have nothing to do with central banks’ combined “economy.” This was all after, recall, first saying that oil prices were the exclusively supply-driven and that lower oil prices would be a huge boost to consumers. Thus, if monetary-driven inflation expectations actually worked as advertised, oil prices would have little effect upon “inflation” since the raw monetary transmission would reroute to something else apart from energy. This is as brazen a misdirection as that which animates Janet Yellen; as if the word “transitory” ends all debate. The ECB issued record levels of bank “reserves” in 2012 when the HICP was just a shade under 3%; by the time they went to the negative deposit rate last year it was under 1%, so what was gained other than the vast sovereign bond bubble? When QE started in March, “inflation” was -0.1% and is likely to be that level or lower next month (for September). Here in the US, Janet Yellen spent last week hammering home “transitory” once more (proving that the use of the word “transitory” isn’t transitory, which actually undermines its very usage) because of her view of the anchor of long run expectations. Again, based on nothing more than belief, she asserts that inflation and the recovery are assured because they are assured. Having been assured of this for years is not supposed to count, even where oil prices are hinting at exactly that. Which brings us back to the circularity of it all. Markets have been increasingly bearish for some time, the UST curve going all the way back to November 20, 2013. Since that day, economists like Yellen and Draghi, alongside politicians like Abe, have been proclaiming the market view wholly wrong in its temporal assertions – that market expectations only apply to the short run and that monetarism will eventually overwhelm positively. Yet, it is the bearish markets that have been “right” in the gathering negativity in markets as well as the global economy while the assured confidence in inflation let alone recovery are those at the “wrong” end. The idea, as quoted above, of the market “losing” faith in the Fed is correct but only of those coming late to the realization (i.e., those potential Greater Fools the Fed, ECB and BoJ were counting on to never make any distinction). That view obviously includes the wholesale “dollar” which is the financial trigger of both market upheaval and how that has transmitted against these central bank expectations. Central bankers want to ignore oil but oil is the “dollar” and the “dollar” was the only means by which these economists were going to infect expectations to begin with; the “dollar” built their debt-based economic paradise to begin with and its continual removal makes a revisit wholly impossible. Thus oil prices are not some exogenous countertrend working against the various QE’s and ZIRPs, NIRPs and all the rest, oil prices, as the “dollar”, were actively and concurrently disproving the possibilities of all of them. We can see that directly in how separating oil prices really doesn’t deliver much alteration to the current view. In Japan, to start with, the very fact that the “core” CPI (stripping out volatile food and energy prices) is worse than the version that accounts for oil shows that energy is just the most visible part of the failure; it’s really no better beyond. The same is true in Europe, where the “core” HICP is expected to remain under 1% for the foreseeable future; market-based expectations suggest even worse. It isn’t just “inflation”, either. Earnings at Standard & Poor’s 500 Index members are predicted to drop 6.5 percent in the third quarter, chiefly because of the collapse in profitability in the energy industry. Excluding energy, analysts see profit rising 0.5 percent gain, according to estimates compiled by Bloomberg. That passage is a perfect example of rational expectations being disingenuous; as if the +0.5% gain in profits is something altogether different because the sign is positive rather than negative. In any other context, +0.5% profits (with markets recognizing only downside potential) is atrocious (particularly combined with valuations continuing around the 90th percentile or worse) and would be rightfully considered suggestive of a present tense economic stumble. That the quote was taken from an article pleading that the increase in announced job cuts is to be ignored since the “rest” of the economy remains superduper is perfectly consistent with my argument. That is, ultimately, the true reflection of how central banks have lost control this year. Markets are no longer even thinking about the upside, only trying to get a handle on the prospects for the downside. Central banks have thus been forced off their expectations management regime, arguing instead that the world isn’t as bad as some already fear andare now actively pricing. Worse yet, all they have left is the same “transitory” promises that have already been downgraded to unhelpful noise. 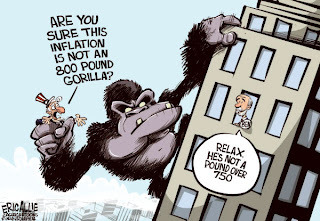 The FOMC has been shouting about a “transitory” inflation setback for three years now, with the “dollar” working against that the whole time, and only now are broader markets making the connections – the “dollar” has been right about all of it so far. The only truly rational expectations are for markets to stop paying attention to central bank promises and interpretations and instead see the “dollar” for what it has been, what it has already “got right” and what that suggests about risks for what might be coming. The ongoing, visible contractions about inflation have little to do with consumer prices.